In November 2007, during a discussion, George Karelas informed me about the existence of a shipwreck near the coasts of Kea island on the Aegean. George had obtained his information from the Assistant Professor of the Department of Geology at The University of Patras, Greece, George Papatheodorou, who some time before had led a team for the mapping of the bottom of a region, north of Kea, with the use of side scan sonar. The information was obvious. It was not about HMHS Britannic, but related to another shipwreck which was generally unknown or at least we did not know of it. Immediately we began researching for the identification of other shipwrecks in the area north and west of the Kea straits, which could correlate with the information provided by George Papatheodorou. This research effort at its early date led us to the footprints of an Italian passenger boat, the S/S Città di Tripoli, that was sunk in July 1941 in the wider sea region, north-westerly of Kea, by the British submarine HMS Torbay. The S/S Città di Tripoli had been built in 1915 in Ancona Italy, and belonged to the Sicilian Company Società di Navali Sicilia based in Palermo, Italy. She had been commandeered by the Italian Royal Navy (Regia Marina Italiana) for the transport of troops. Regia Marina had repeatedly ordained during the two World Wars boats of the merchant marine, with devastating results for the Italian commercial shipping. 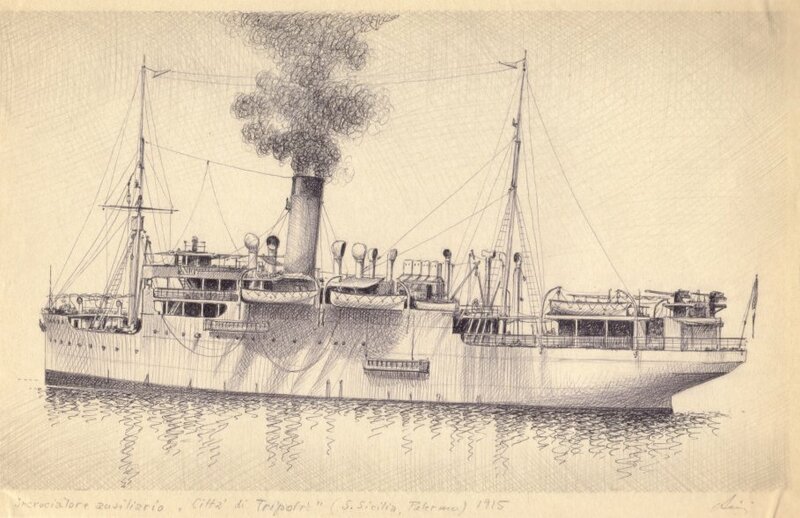 In her last voyage S/S Città di Tripoli, of 3.044 dwt and length of 96,3 metres, sailed from Samos island destined for the harbor of Piraeus transporting soldiers. She was a member of a convoy consisting of yet another merchant boat and two destroyers. The submarine HMS Torbay, captained by Lieutenant Commander Anthony Miers, located the convoy and by firing three torpedoes sunk the S/S Città di Tripoli at 07:22 Hours in the morning of 2nd July 1941. Immediately after the firing submerged in deeper waters and evaded a massive counter-attack involving 18 depth charges. Having initially established a general opinion about the identity of the shipwreck, we continued our research waiting simultaneously for more information to emerge out of the University Patras which had done the bottom mappings of the Kea areas. Some time later George Papatheodorou contacted us and provided the precise coordinates of the shipwreck and its echo picture taken from the side scan sonar, which showed with accuracy the boat laying in the bottom. The shipwreck is upright at a depth of 70 meters, with its fore and aft masts broken and fallen to the starboard side of the ship. Measuring its length roughly-by extrapolating the grid of the echo picture which is incremented by 0,01 nautical mile, hence 18,52 meters, we realized that the “Unknown Shipwreck of Kea” had a length of approximately 130 meters, a fact that led us to change the opinion about the possible identity of S/S Città di Tripoli as this had a length of only 96,3 meters. Our rough estimates were then reconfirmed by the most precise calculations made by a team of students of the Department of Geology of the University Patras. Now with new substantial information and theories, we addressed the issue to friends and researchers who kindly placed their files and knowledge at our disposal. 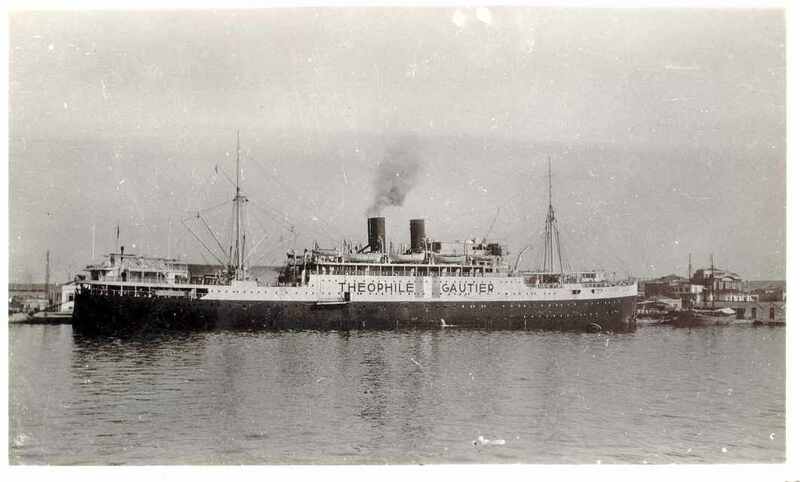 One of them, Platon Alexiadis, informed us for the existence in the region of a French passenger liner the M/S Théophile Gautier which was sunk on 4th October 1941 by the British Navy submarine HMS Talisman. 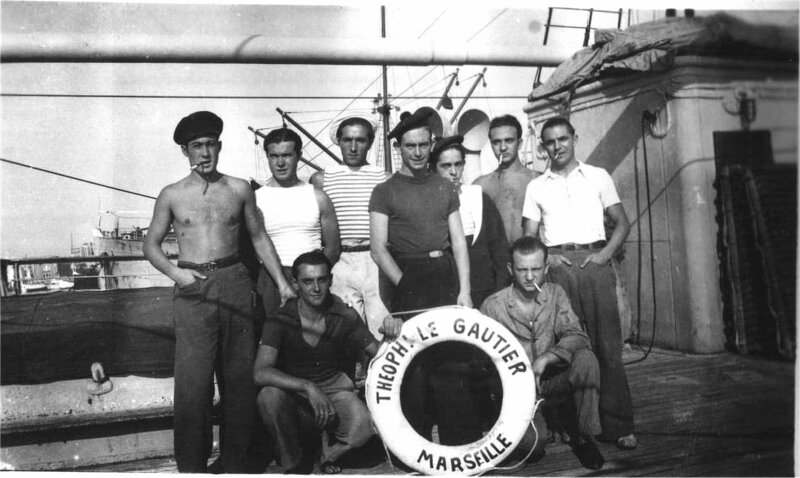 The M/S Théophile Gautier, registered in Marseilles, belonged at that period in the jurisdiction of the Vichy French puppet government and for this reason the French flag was considered as hostile by the Allied Forces. The boat – 8.194 dwt and with a length of 133,5 meters, according to its shipping company, the Messageries Maritimes, (and 129,84 meters of length, according to Lloyd´s Register)- had sailed on midday of 3rd October 1941 from Thessaloníki with her first port of call being Piraeus and as its final destination Marseilles. During her early leg of the voyage joined a convoy consisting of the Italian tanker Torcello, the German cargo steamboat S/S Delos, and three escorting Italian torpedo boats the TB Monzambano, the TB Calatafimi and the TB Aldebaran (ref. 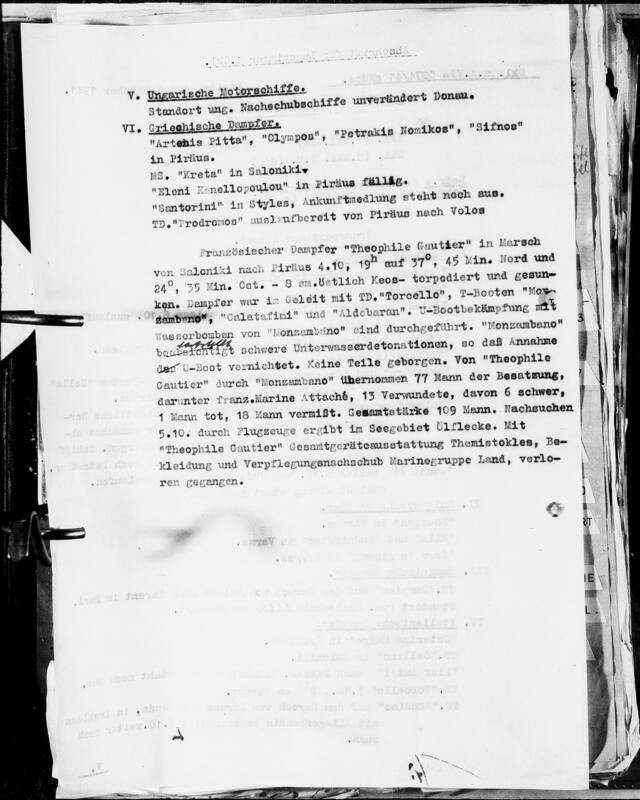 Seeverteidigung Saloniki in NARA T1022/2669). On 4th October, after she rounded the cape of Cavo D’Oro (southern Evia), she was spotted by the submarine HMS Talisman, captained by Lieutenant Michael Willmott, and was sunk in the same afternoon by one of the four torpedoes that were fired by the British Navy submarine. From the 109 souls on board 18 were lost during the sinking among them the second officer, while one more died later from his injuries. Rescued the survivers were transported to the TB Monzambano, which also commenced its counter-attack by launching depth charges in an effort to sink the HMS Talisman which had already descended into deeper waters. and two four degrees, three five minutes East. Hour 1900 “THEOPHILE GAUTIER” was torpedoed. Hour 1925 “GAUTIER” began to sink. The French Naval Attaché notified from here. Now we had established the primary source of the sinking coordinates, which were used repeatedly in future reports by most historians covering this incident. 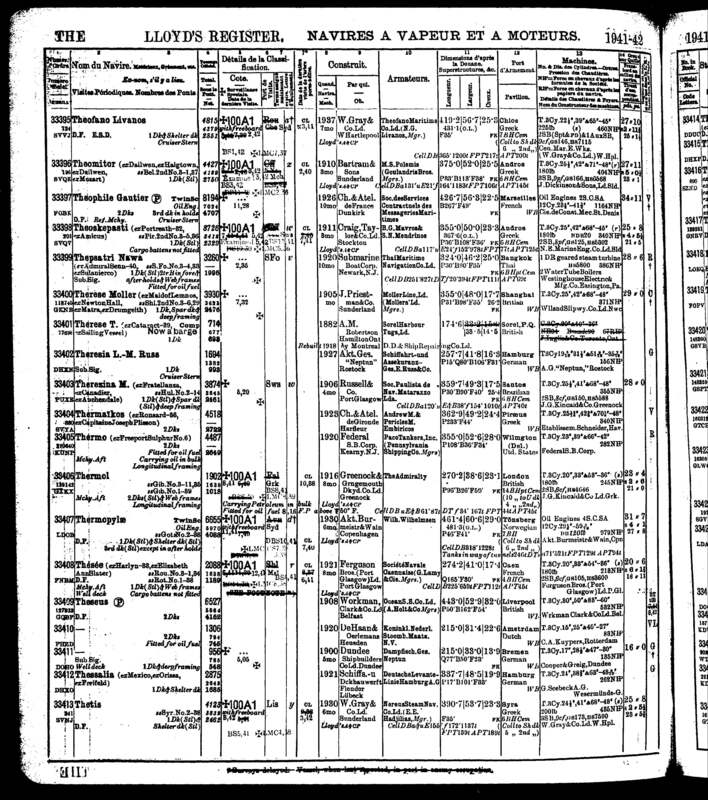 Even in other bulletins of the German Navy (Kriegsmarine), exists a small report that the M/S “Théophile Gautier“ was sunk “eight nautical miles east of Kea” (cf. p. 807), this being a mistaken report has remained so and was repeated in the future by almost all the secondary sources that have reported the incident. In this phase of our research we had obtained the German registrations based on the initial reports from Italian captain of the TB Monzambano, but what we did not yet had was the British Navy counterpart registrations for the same incident. The problem however in finding them was the fact that the HMS Talisman had been sunk without survivors on 17th September 1942, near Sicily. 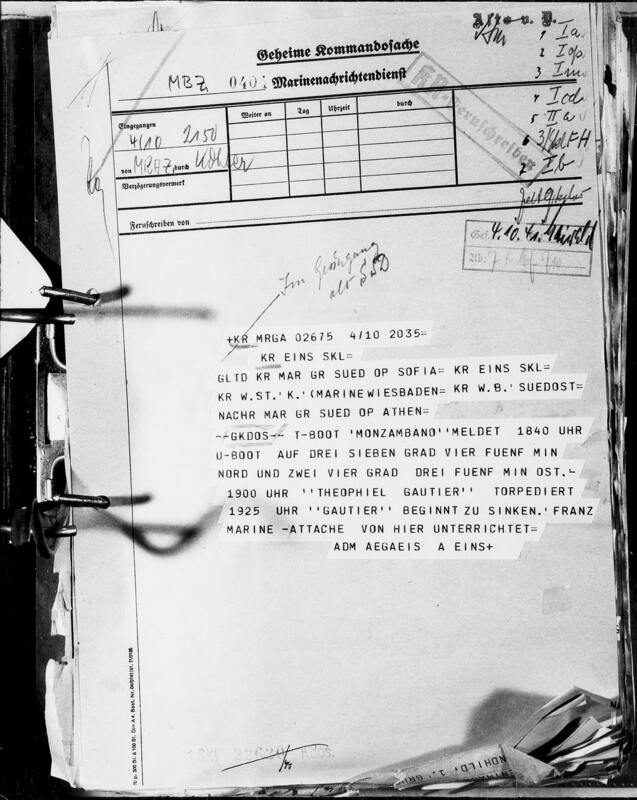 With great help from the historian Platon Alexiadis, we found a copy of report by the commander of the submarine HMS Talisman, Michael Willmott (which describes at greater length the attack), in the National Archives of Britain, in the file No. ADM199/1151. In this copy of the report there is a registration which provides a different picture of the incident and the likely spot of the shipwreck. The Captain of the HMS Talisman declares that on 4th October 1941 with North-Northeast winds of intensity four Beaufort’s and the sea lightly upset, during sundown at 17:54 hours and coordinates 37° 48´ North and 24° 29´ East, spotted a vessel of roughly 9.000 dwt, bearing resemblance to the boat Sphinx. The located vessel, with its main characteristic being her two funnels and size, with a speed of 10 Knots and bearing a course of 225°, was a member of an enemy convoy and was accompanied by three torpedo boats, one of them recognized as a Maestrale Class. The submarine HMS Talisman maintained a course of 218° and a speed of four Knots. After the sub tried to decreases the distance that separated her from the target, launched at 18:35 Hours the first of four torpedoes from a distance of roughly half mile (1.000 yards), positioned at the moment of the attack in the rear of the convoy. 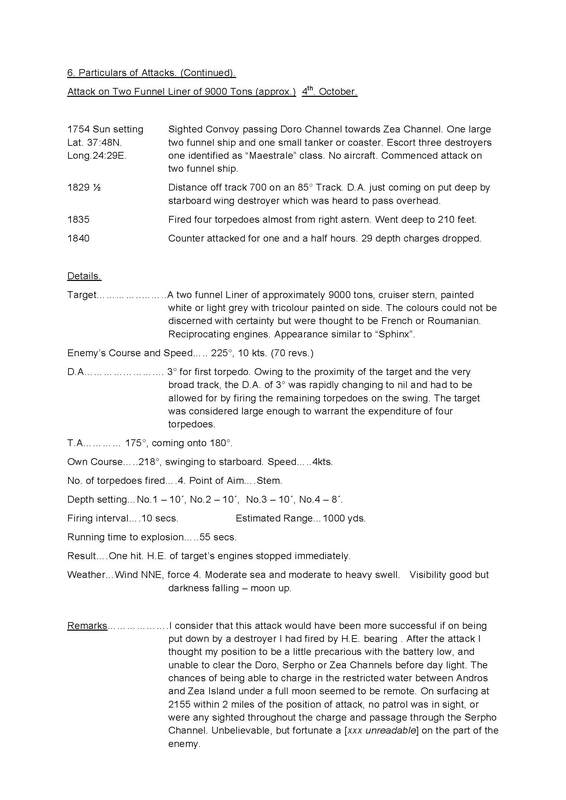 The sub’s Captain had calculated that the torpedoes would find their target in 55 seconds from the moment of firing. The result was a marked explosion which meant that the target was hit successfully. According to the information provided by the Captain of the submarine, the target boat engines stopped immediately. Right away the sub dove deep in order to avoid the anticipated counter-attack from the Italian accompanying torpedo boats, which was mounted by the TB Monzambano launching a large number of depth charges. Roughly two hours later, after four powerful underwater explosions were heard, TB Monzambano, believing that she in turn had achieved her objective, abandoned the hunting of the British sub. According to the afore mentioned reports, 41 minutes elapsed from the moment of the initial spotting by the British sub up to the moment of the attack during which the M/S Théophile Gautier continued her course with a direction of 225°. During these 41 minutes, by maintaining a speed of 10 Knots means that the ship covered a distance of roughly seven miles. This calculation leads us to the conclusion that the attack should have taken place at the coordinates 37° 43, 6´ North and 24° 23, 4´ East. The distance between this point and that of the registered place of sinking of the M/S Théophile Gautier, according to the German files, is approximately 10 nautical miles. The distance between the position of the first spotting of the M/S Théophile Gautier by the HMS Talisman and the location mentioned by the German files, is roughly 5, 5 miles. The distance from the point of torpedoing up to the point that has been located “the Unknown Shipwreck of Kea”, is roughly 6 miles. 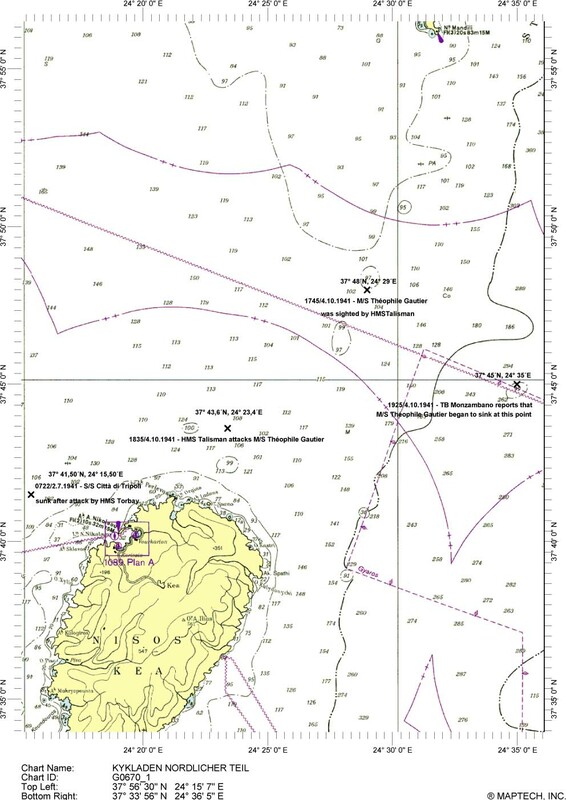 • Inaccurate report of the sinking of M/S Théophile Gautier from the Captain of TB Monzambano. The declared point of sinking is found very far from the course that it should have and differs by ten miles from the likely point of the attack. 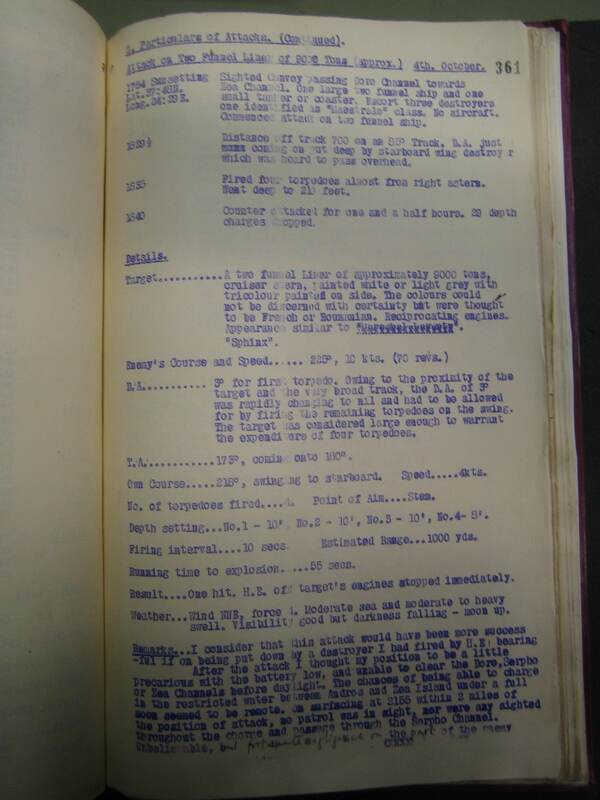 Also, there is a half hour difference in the recording of the attack as registered in the German files (19.00) and by the registration of the report by the Captain of the British Navy submarine HMS Talisman (18:35) – a fact which strengthens the opinion that we are dealing with inaccurate information. • The report by the Captain of the submarine HMS Talisman appears as more precise, even if in this also exists the possibility of errors. The fact however that the submarine was found near the island coast of Kea and was tracking her target, strengthens the opinion that the geographic elements which are reported should be relatively precise. • The fact that TB Monzambano, was occupied with the collection of survivors and for mounting the counter-attack against the HMS Talisman, leaves a lot of margins of errors in its report, in relation to the coordinates and the hour of the sinking. • The fact that the point where “the Unknown Shipwreck of Kea” is found deviates very-very little from the axis of a 225° course, which M/S Théophile Gautier was bearing, plus the fact that she is found sunk roughly six miles from the point of the attack, both strengthen the assumption that this is the M/S Théophile Gautier. • The 54 minutes elapsed from the moment of the attack up to the moment where the boat began to sink, are enough in order for her to cover a distance of roughly 6 miles. In addition, when we know that the prevailing winds were North-Northeast. Besides this point, it is not known if during the rescue operation, the striken boat was towed or if she was left to drift. • The size of the shipwreck in conjunction with the “raising” that it makes on the depth sounder image from the bottom (roughly 20 meters), in combination with the results of the University Patras measurements and the information that in the shipwreck “are distinguished two funnels”, also strengthens the assumption that this is the M/S Théophile Gautier. • The fact that in the various files there is no mention of a registered shipwreck of this size in the region of Kea after the 2nd World War, limits the scope of research in the period between the two World Wars. Hence during this period a shipwreck with a length of roughly 130 meters, with two funnels, which was sunk in this region, is that of the M/S Théophile Gautier. According to the aforementioned, we assume that a possibility exists, whereby “the Unknown Shipwreck of Kea” is indeed the shipwreck of M/S Théophile Gautier. The simulation of history is always rendered in a theoretical level, as no one can be sure for the “historical facts” without tangible and non-contradictory proof. Up to the time when we can dive the sunken wreck, hoping to discover her identity beyond any doubt, the issue remains for us an “ad hoc theory“, about “the Unknown Shipwreck of Kea”. However, the research that we have carried out so far convinces us that there are a lot of probabilities that this shipwreck is going to be the M/S Théophile Gautier. This assumption becomes the main scenario for our planned diving mission (Kea Dive Expedition-KDE), drives its preparation and is endowed with the proportional historical knowledge in an effort to cope with the needs and the set objectives, which are summarized as: the research, identification, and documentation of “the Unknown Shipwreck of Kea”, extending to the uncovering of unknown aspects of the Greek naval history, as this story has unfolded during the Second World War. Whatever may be the identity of “the Unknown Shipwreck of Kea”– that of the M/S Théophile Gautier or the S/S Città di Tripoli, or some other ship name, it does not change the fact that the future has to offer a new neighbour to the “sister” ship of the RMS Titanic, the famous HMHS Britannic. Furthermore, this particular shipwreck will also become a new and accessible (because of its depth), worth diving site for the Greek and visiting International SCUBA divers.